Vintage Bathroom Faucets were made in many configurations. I have my favorites and I usually have at least one that I am restoring. 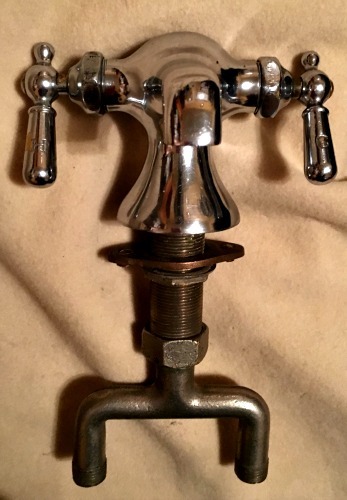 The traditional "Separate Taps" that I have to offer can be found on my page, Vintage Faucets,Separate Taps. 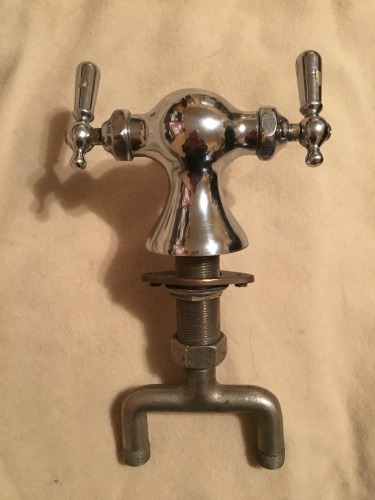 What I am listing here are the "mixing valves", they mix hot and cold water at a single spout. 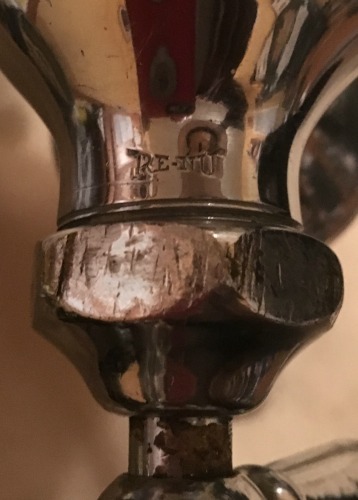 These images are of a Standard RE-NU one hole faucet. The stems are in good condition so they have not been changed, the seats however are new as are the cap gaskets and stem packings. This faucet had sheared away centering posts at the yoke union. I had to drill the remnant brass out of the post sockets and then cut new posts out of brass rod and solder them into the top of the yoke. I also fashioned a new yoke gasket out of rubber gasket stock. The stems this faucet uses are available and if I were to have the fixture plated in fresh chrome I would install fresh stems at that time rather than plate used stems. 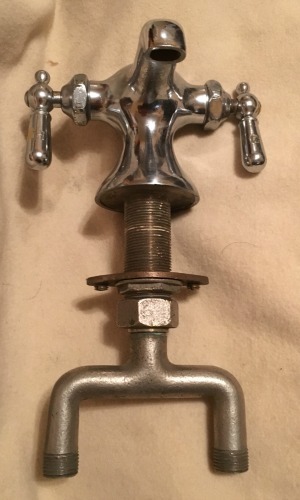 The flat plate with shallow sets screws on the shank above the securing nut are not original but they make it possible to secure the faucet in a way that does not cause it to twist in place upon final tightening. 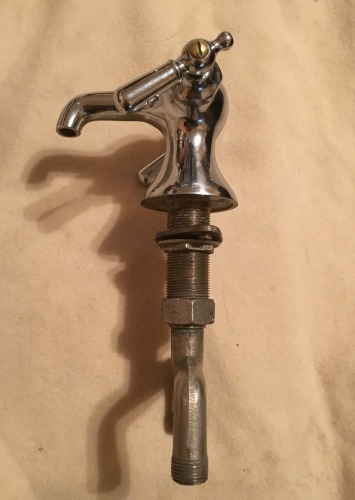 This was ever a problem with these one hole faucets and they often required another set of hands, holding them still, to set them and also to snug them if they were to work loose in their placement. 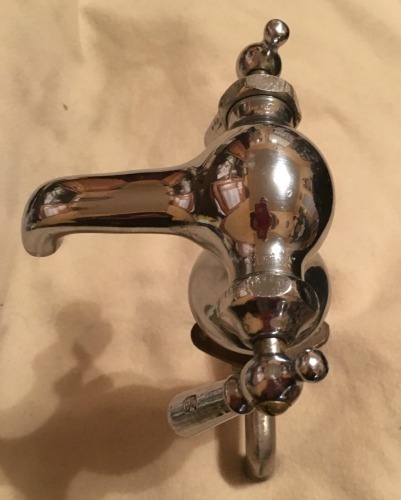 One sees these faucets on old lavatories that were meant to have separate taps, thus the look remains vintage and there is the advantage of having a mixing valve style faucet. When this is done there is typically a soap dish installed in the unused tap hole. 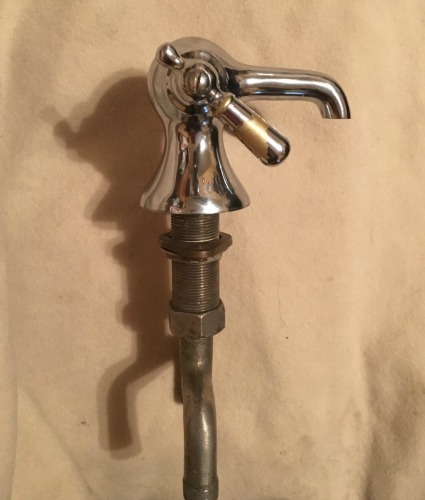 I had occasion to see this treatment years ago and there was I vintage soap dispenser in the hot side tap hole that was not working because the brass lift tubes had rotted away in the caustic soap. You will find a few images of that project on my page...Antique Faucet Repair. 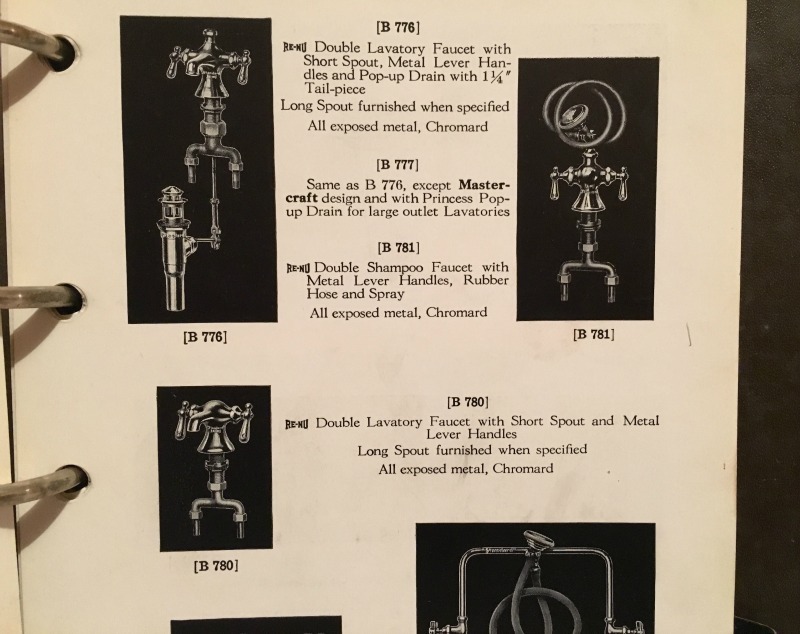 This faucet is listed in my 1937 "Standard" catalog along with some of its variations. 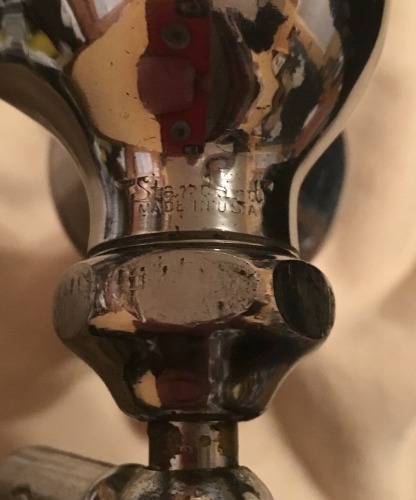 An image from the catalog of the faucet and a few of it's variations is at the bottom of this page. This "Standard RE-NU" faucet is priced at $475.